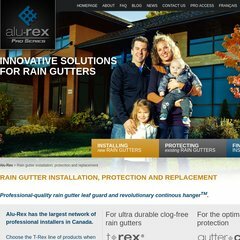 www.Alu-rex.ca - Alu-Rex - Forget about Your Eavestroughs! Topics: Alu-rex Eavestrough Solutions, & Gutter Clean System Leaf Guard. It is hosted by Godaddy.com Llc (Arizona, Scottsdale,) using Apache/2 web server. The programming language environment is PHP/5.2.6-1+lenny9. ns45.domaincontrol.com, & ns46.domaincontrol.com are its DNS Nameservers.